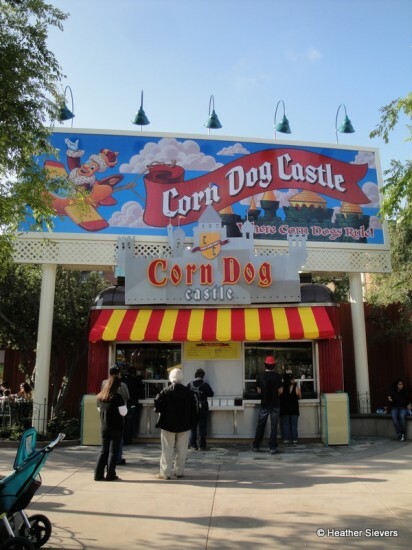 Heather Sievers has some great Dining in Disneyland news this week — the Corn Dog Castle is back in action! Nestled between Seaside Souvenirs and what will soon be the new Goofy’s Sky School ride is a little gem that’s been closed for quite some time. When I heard last week that Corn Dog Castle had reopened, it was almost too good to be true. So, of course I had to go and see it to believe it. The Corn Dog Castle is Back! 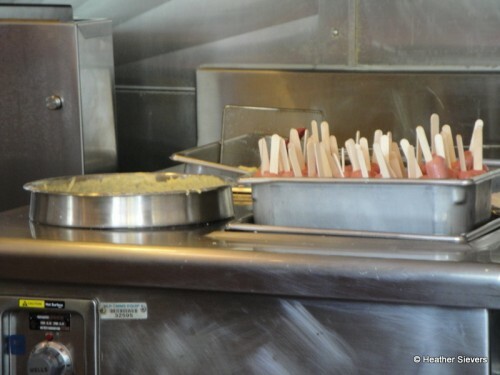 Although corn dogs have been available at California Adventure during the closure (first at Farmer’s Market, which eventually closed for the construction of Cars Land, and then at Award Wieners in the Hollywood Pictures Backlot), it was not the same as getting one from the original corn dog king. Seeing it open again was almost as exciting as walking up to the window and placing an order. The menu at Corn Dog Castle remains the same as pre-closure. Perfect and simple, you have 3 different battered options. 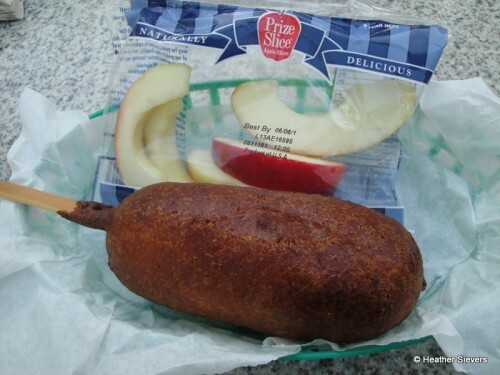 The Original Corn Dog, which is made of a chicken/beef combo, can be purchased for $5.99 and comes with a choice of apples or a bag of potato chips. 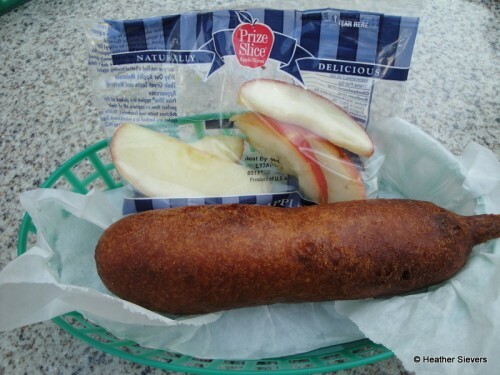 The Hot-Link Corn Dog will set you back $6.49; it also comes with your choice of apples or potato chips. And the third menu item is the Cheddar Cheese Stick at $5.99 ; it’s joined by apples or potato chips as well. It had been eons since our last Corn Dog Castle indulgence, so we decided to get one of each menu item to share. While ordering, I asked the cast member if she’d snap a some photos inside for me. Lucky me, she did, so I got a few of the Original Corn Dog prep. 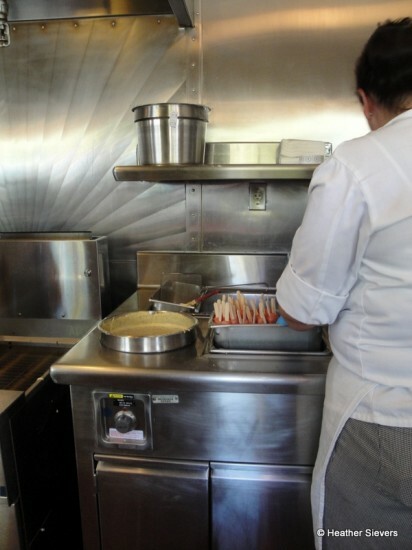 All menu items at the Corn Dog Castle are hand dipped and made fresh to order. The Original Corn Dogs were just as good as always. We’d been getting them at Award Wieners over the past several months, so luckily we hadn’t been missing out. The crunchy golden better was fried to perfection and tasted delicious. The sweet batter combined with the saltiness of the chicken/beef hot dog and a little mustard & ketchup is heaven on a stick. 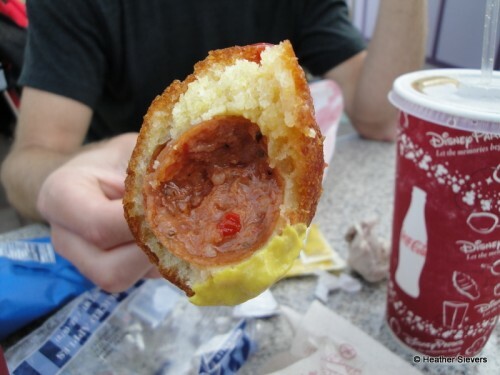 My husband tried the Hot-Link Corn Dog. This was our first time ordering one and it is only available at the Corn Dog Castle. I actually did not have a bite. As soon as he told me that it had a pretty good kick to it, I was out. I’m not a fan of spicy, but he did enjoy it and ate the whole thing. 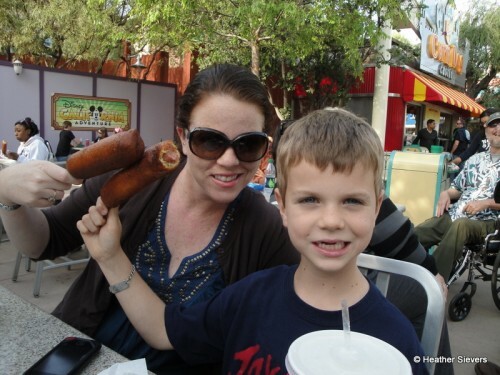 All in all, he preferred the Original Corn Dog, but was glad he had given the Hot-Link a whirl. Now, on to a hidden food gem of Disney’s California Adventure that everyone should know about: The Cheddar Cheese Stick. 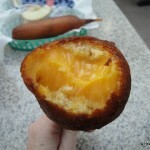 Orange gooey cheddar cheese covered in crispy sweet goodness, all easy to eat on a stick. I’m not sure if I could have eaten a whole one (wait, who am I kidding? 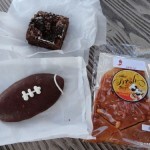 I totally could have eaten a whole one), but it was a perfect item to share. 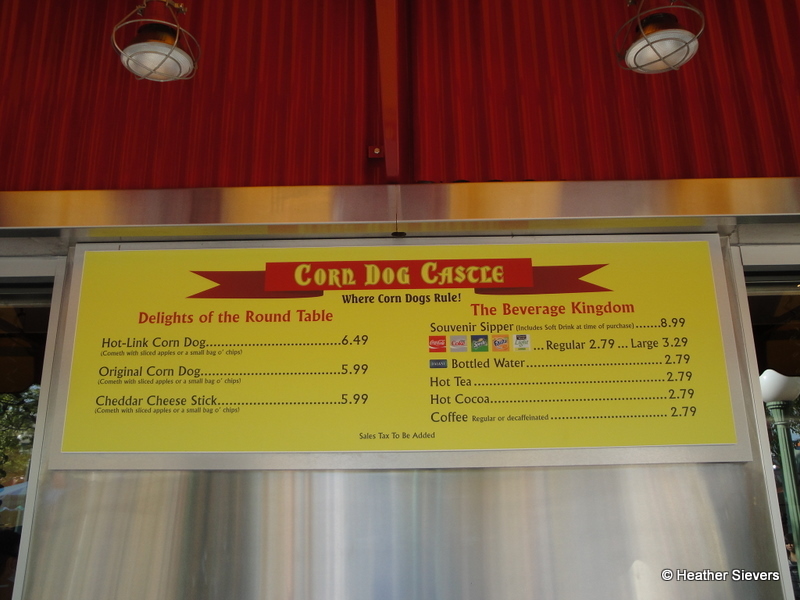 We’d never tried the Cheddar Cheese Stick from Corn Dog Castle, which is a crying shame. Now that I know it is there, I will never ever forget. If you’ve ever had the ones at Hot Dog on a Stick from the fair or in the mall, it’s like a million times better. All because of the batter. The batter is sinfully delicious. I wouldn’t recommend eating one of these artery cloggers on a regular basis, but it’s definitely worth it as a “once in a while” treat. 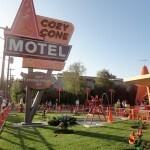 Another awesome surprise from the Corn Dog Castle is that they’ve added some seating directly next to it. A handful of tables and chairs as well as two planters with benches surrounding them that can be used as additional seating are now available. Because the walls to Goofy’s Sky School are still up, I do not know if the seating is temporary. 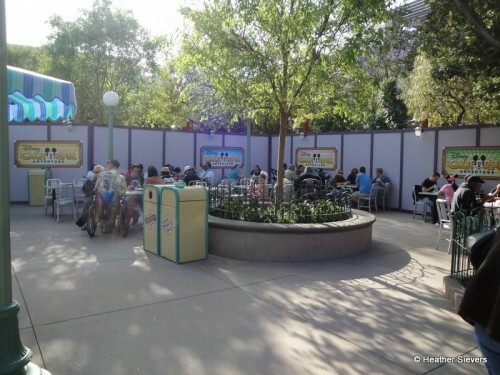 There is a good chance that when the walls come down the closest seating will be at the new Boardwalk restaurants (just a few steps away), which are scheduled to open at the beginning of July. I for one, would love to see this seating remain. It was pretty fun to order corn dogs and sit right down for enjoyment! 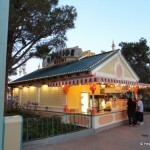 If you’re at California Adventure and are looking for an affordable, tasty meal, the Corn Dog Castle is a must visit. My only complaint, well two small complaints actually, is that their beverage choice is limited to sodas, water, coffee, tea, & hot cocoa. I’d love to see milk and juice added for kids. 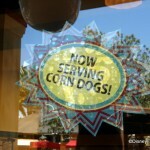 Note: As of now, corn dogs will continue to be available at Award Wieners in the Hollywood Pictures Backlot. However, they do not carry the Cheddar Cheese Stick or the Hot-Link Corn Dog. « More Details on Disney World’s New Dine with an Animal Specialist Option: Menu, Photos, and Activities! I’m so happy the Corn Dog Castle is back! I was worried that it would go away when the Mermaid Ride came in! I remember the first time I ordered a corn dog here . . . I was a little worried because it looked “burned.” I was so completely wrong! This is not what you get at the county fair! 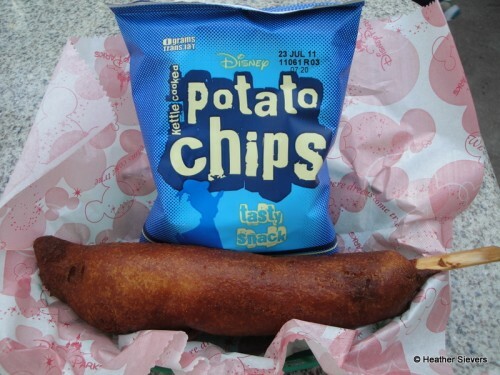 This is a major step above in corn dog goodness! Glad to see that they look like the same dogs they did before the renovations started! This is my husband’s favorite counter service. He loves the hot link. We just happen to be visiting this weekend for my birthday! I’m glad there is more seating. That was the only problem about eating there. We’d either have to balance on a fence or sit on the ground. 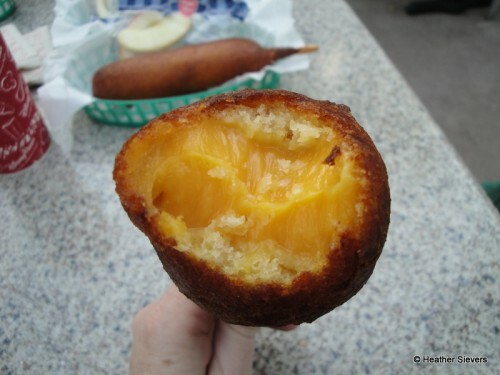 We leave for DLR in 14 days, and both the Original Corn Dog and the Cheddar Cheese Stick are now on my foodie to-do list! I took a bite of my son’s corn dog from Farmer’s Market in September, but can’t wait to finally get to enjoy one of my own from the famous Corn Dog Castle! Best news I have heard in ages! Was very sad when the Castle closed two years ago (made a special trip the last day!) and am now very happy it will be there when I visit in October! Now added to my ever-growing list! John — For serious. A STEP UP! Melinda — I have GOT to try a hot link! Shayne — Did you get the cheese stick? Madoka — You’re making ME hungry! Can’t wait to try a hot link. I second that vegetarian option. I would love to see this as a soy dog but a chicken frank would be a good option too. Is this still open? I need to try the cheese stick!!!!!!!! Is this still open? I need to try the cheese stick!!!!! Melussa — Yes! It’s still open. This sounds so delicious! 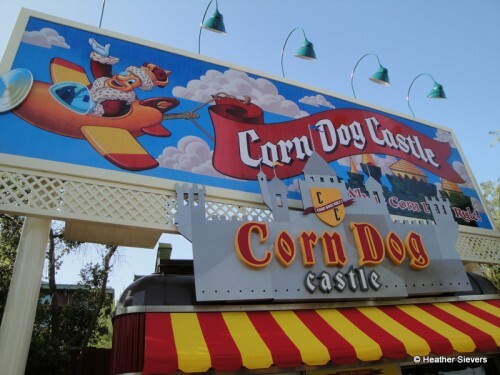 I really want to try out Corn Dog Castle during our upcoming Disney trip this summer (first time to California Adventure)! Do you happen to know if the hot link is also beef/chicken? 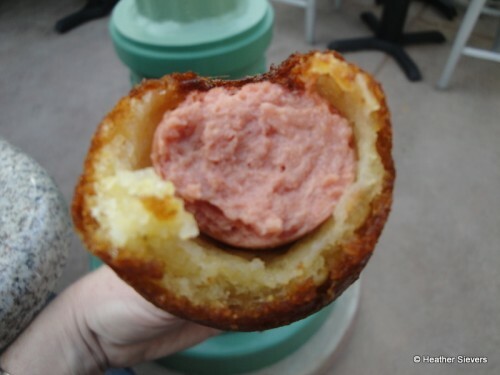 I love spicy food, but I can’t eat pork, so I’m curious if the hot link corn dog will be an option for me.